SPECIFICATION / Size:1.9"8L x31.7"W x62"L,Top Step Height:37.4",Step Size:10"L x15"W,Total Weight:24 LB,Load-bearing:330 LB. 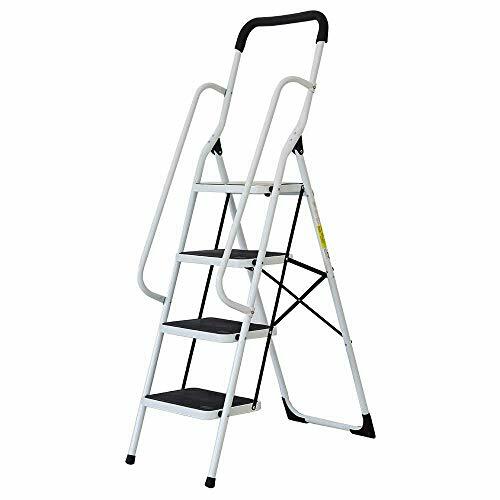 ABSOLUTELY SAFETY LADDER / There is a safety lock under the top step that when you extend the step ladder,just use it to link the board and frame.You can work securely on the ladder. HUMAN-BASED DETAILS / Every step size is 10" x15" equivalently size 8 shoes can all step on it,also with anti-skid surface.The handrails on both sides and top can help you work better. The top handrails are covered with soft sponges to prevent slipping. SPACE SAVING / When you don't use the ladder, fold up and store it against a wall or corner,won't use much space. PRACTICABLE STEP STOOL / The top step height is 3.1 ft(37.4"),Very suitable for indoor using,such home,office,shop,school and so on.